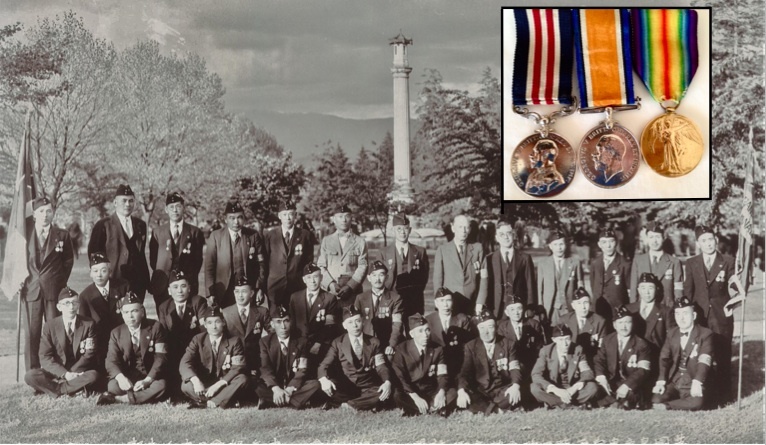 Japanese-Canadian veterans of the First World War gather at Japanese Canadian War Memorial in 1939. Sgt. Masumi Mitsui kneels at the centre of second row, his three medals (see inset) still worn proudly. The old soldier was not tall. When he signed up in the late summer of 1916, then not quite 30, a doctor had listed him as 5’4”. The intervening generation may have stolen another half inch. But the mountie, looking up from his chair on the other side of the desk, would not have called the man short. His bearing, the way he held his shoulders and head, his field-dress tunic — antique but immaculate — gave the veteran an imposing presence. Still there was something odd about how the man was turned out, the mountie thought, something missing. He took in the three-bar chevron on the soldier’s sleeve before speaking. outside the livestock building on Vancouver’s fair grounds because the country for whose acceptance he had fought on the fields of France and in the halls of the B.C. legislature, had turned its back on him — and on 27,000 of his fellow Canadians. My grandfather was more actor than soldier, more poseur than husband or father, and the lovingly assembled scrapbook he left behind after serving during the First World War reveals more about his character than he intended.